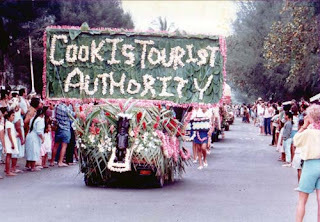 Christianity arrived in the Cook Islands, Aitutaki in fact, on 26 October 1821 and the country has a public holiday to celebrate the event. This year it fell on a Sunday so the Gospel Day holiday was observed on Monday 27 October. Avarua Ekalesia (church) was host for the Gospel Day dramas known as nuku which took place in the Takamoa theological college grounds. The video shows excerpts from the first three nuku, Avarua, Nikao and Arorangi. There were no explosions or fires this year but Nikao’s Adam and Eve drama was a lot of fun in spite of the pouring rain with Eve out for a night on the town, dancing with the mapu and being tempted by Malibu – coconut rather than apple but the end result was the same. On the subject of drama, there’s a New Zealand film crew on Rarotonga at the moment shooting a new children’s television show called Paradise Café. The thirteen-part comedy mystery series is due to be shown on the BBC in January next year. The café of the title is at Betela beach and other locations include Highland Paradise, Black Rock, Crown Beach Resort and snorkelling scenes at The Fruits of Rarotonga beach in Titikaveka. We spotted some filming going on at Black Rock yesterday at dog-walking time. Well, the first thing we noticed was a Portaloo, and then a large number of cars parked nearby. Haven’t seen so much activity there since one of the cargo ships ran aground on the reef and was towed off by four or five tugs and fishing boats a few years ago. Rarotonga isn’t actually named but the show will include some local cast members, extras and the use of a few Maori phrases so let’s hope we eventually get to see it all. The grassy patch in front of the Banana Court remained a hive of activity as the vaka carvers continued their work. After the initial rough shaping with chainsaws there comes the long drawn out job of hollowing out the canoes with chainsaws, crowbars and adzes, followed by planing smooth both inside and outside. 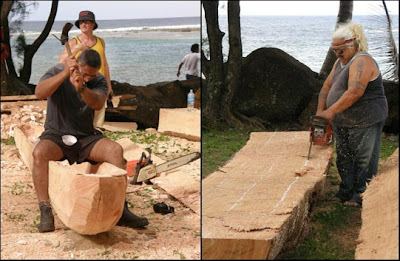 Rarotonga's traditional canoe carving project, ‘akateni i te vaka’, is proceeding well. 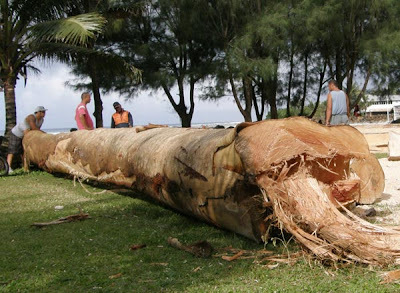 For the past week the grassy area opposite the Banana Court has echoed to the sound of chainsaws, planes and a variety of hand tools as large albesia logs are shaped into sea-going vaka. Most of the carvers are men but there are a couple of women who are clearly experts and plenty of kids making themselves useful - it's school holiday time here. This video shows some of the early stages, sawing the logs into rough canoe shapes and then hollowing out the inside. At the end of next week (23 October) a National Geographic adventure travel show ‘Treks in a Wild World’ team, will be on Rarotonga filming the carvers and their canoes. Tourist fly into Rarotonga all year round, mostly travelling via New Zealand (and from next February they’ll ALL have to come via NZ) but every September we get a number of long-distance travellers who wing it here all the way from Alaska. 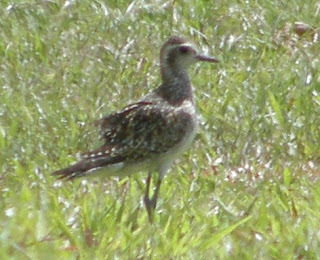 Most of the Pacific plovers (local name torea) travel the 9000 kilometres to Rarotonga non-stop, apparently taking about 5 days. They are thin and scrawny-looking when they arrive here and spend the summer fattening up on insects before heading back to Alaska at the end of April to breed. The airport is the residence of choice but you see the birds, widely separated, on large areas of short grass. You have to wonder how they coped in the days before lawn mowers. 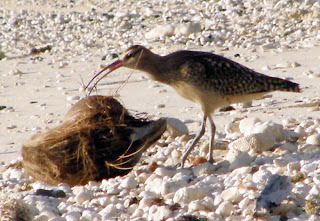 Cook Islands Biodiversity Database showed they were bristle-thighed curlews (teue) which also breed in Alaska and are a globally endangered species. The current world financial crisis is having a – so far – small effect on life in the Cook Islands although the offshore banking fraternity might not agree. According to a story in Saturday’s Cook Islands News our two major trading banks, ANZ and Westpac, both Australian entities, are robust, well-capitalised and well regulated. There will probably be a change in interest rates down the line, they say, and if people overseas have to think twice about travelling it will cut the number of tourists. Bad news for hotels, motels, restaurants and many others in the hospitality industry. It seems strange that US companies lent money to people who couldn't pay it back, causing a global money meltdown but resulting in the US dollar becoming stronger against other currencies (such as the kiwi dollar which is the one that concerns me!) If any Americans have some cash stashed away, under the matress or buried in the back garden perhaps, they should consider a holiday here. With the exchange rate the way it is they'll get a bargain, assuming they can get here since Air New Zealand is axing LA/Rarotonga direct flights. And one of Cook Islanders’ favourite pastimes is travelling overseas so the sliding kiwi dollar is going to drag holidays down with it, at least for those of us who pay for them ourselves. Politicians and other government employees will no doubt continue to take wing at taxpayers’ expense regardless of exchange rates. We had our mortgage sales and business meltdowns, some quite spectacular (think PDL and Tepaki), but they're home-grown failures. Can't blame the global situation or acts of God. Now when it comes to acts of God, the six ekalesia (churches) on Rarotonga have started organising their Gospel Day nuku. (For a run-down of Gospel Day check this video). Twenty or so years ago the competition to win the trophy for the best nuku (biblical drama) was cut-throat but nowadays it’s theoretically a more laid back occasion with lots of singing, dancing and dressing up but no trophy at stake. Tell that to Arorangi and Avarua who in recent years have presented full scale Hollywood productions complete with special effects. Great fun.